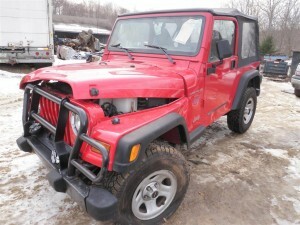 Just in this 1998 Jeep Wrangler is at it’s end of life and we are recycling the parts to save you money. We have inventoried this car for all of the quality OEM parts available and have them all in our computerized inventory system and ready to sell. All of the body and interior parts are inspected for condition and any damage is disclosed. All mechanical parts are tested and stored in our warehouse. All of our parts come with a standard 6 month warranty and we offer extended warranties for purchase. We ship our parts nationwide so if you need a part and don’t live in CT, no worries, we can ship it right to your door! Some of the parts we currently have in stock off of this 1998 Jeep Wrangler are: Air Cleaner, Air Conditioner Compressor, Alternator, Axle Shaft, Blower Motor, Brake Calipers, Brake Master Cylinder, Rear Bumper Assembly, Center Console, Cylinder Head, Front Door Assembly, Door Side Mirror, Electronic Engine Control Module, Floor Shift Assembly, Flywheel, Fuel Filler Neck, Fuel Pump, Fuel Tank, Fuse Box, Glove Box, Harmonic Balancer, High Mounted Stop Lamp, Rear View Mirror, Sun Visors, Oil Pan, Power Brake Booster, Power Steering Pump, Radio, Front & Rear Seats, Speedometer Head Cluster, Stabilizer Bar, Starter Motor, Steering Column, Tail Lamps, Temperature Control, Trailer Hitch, Transfer Case Assembly, Transmission, Front Door Trim Panels, Wheels, Windshield Glass and MANY MORE PARTS!